The Saturday night New York Ranger and New York Islander prospect report did not come with a "cutesy" title as I have a 5 word requirement for some reason for advertising purposes. Hey I need to generate some kind of revenue to keep this site going so 5 words it is. Still it was an entertaining evening once again featuring a couple of different prospects in the spotlight as well as one now very regular one. 3-2. Duclair scored Quebec's 2nd goal of the game, a power play goal in the 1st period giving Quebec a 2-0 lead. His assist also on the power play was the primary one and gave Quebec a 3-0 lead. Duclair is 9th in the QMJHL in scoring (22-11-33), 2nd in goals (22), 7th in power play goals with 7 and 5th with game winning goals (4). Duclair is on a pace to go 62-32-94 but more importantly is will these numbers help Duclair gain a shot at Hockey Canada's World Under-20 squad? 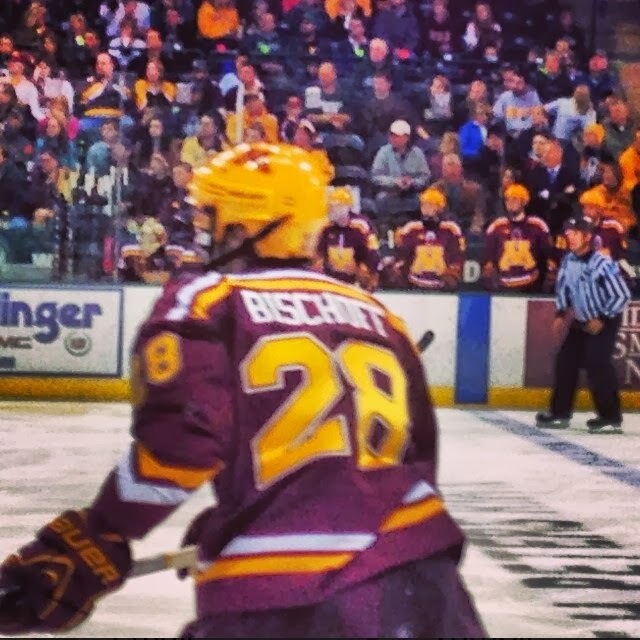 Jake Bischoff (NYI 2012 7th) until this weekend was only playing the 2nd game of weekend series for his top ranked Minnesota Golden Gophers; that is until this weekend. Bischoff's 3rd goal of the season was all that Minnesota really needed as they shut out in-state rival Minnesota State 3-0 to sweep the 2 game series. Bischoff scored at 6:20 of the first period giving Minnesota the only goal that they would really need and the goal was also Bischoff's 2nd game winner. The skinny on Bischoff was that he had a world of offensive ability but his defense needed work. The offense is there and Bischoff is holding his on defense. Sometimes a player's efforts won't show up on the scoresheet as is the case here with Troy Donnay (NYR 2-13 UFA). Entering the 3rd period against the Guelph Storm, Donnay's Erie Otters were trailing 3-0 and it was looking like the Otter's 4 game winning streak was over. The Otters would score 3 shorthanded goals in the 3rd period to tie the game and force overtime where they would need just 53 seconds to score the game winner for a 4-3 win. Donnay was part of the penalty kill unit that was on the ice for 2 of the shorthanded goals and he was out there for the game winner. A project player? Sounds like the project is showing some serious improvement. What matters is Erie won again and continues to win. Donnay's teammate Adam Pelech (NYI 2012 3rd) was scoreless like Donnay in Erie's win over Guelph. Pelech is making a huge case for why he deserves to be on the Team Canada roster which is really looking as it the defensive corps will feature 3 Islander prospects. Brady Skjei (NYR 2012 1st) and Taylor Cammarata (NYI 2103 3rd) were both scoreless in Minnesota's 3-0 win over Minnesota State. Skjei took 3 shots and was a +1 while Cammarata was "even" on 0 shots. For Minnesota State, goalie Stephon Williams (NYI 2013 4th) was the backup and appears to have lost (at least for now) the starting job. Ryan Graves (NYR 2013 4th) scored his 2nd goal of the season as his Charlottetown Islanders defeated the Moncton Wildcats via the shootout 3-2. Graves scored the Islander's 1st goal of the game as he was a +1 on 4 shots with a minor for cross checking and 1 hit. Cristoval Nieves (NYR 2012 2nd) had the only assist on his 2nd ranked Michigan Wolverines 1st goal as they defeated the Nebraska-Omaha Mavericks 4-3 to earn a split of the weekend series. Nieves is 1-5-6 on the season took only 1 shot and was a -1. I will repeat this until he does it and that is become more active (more shots or attempts). Griffin Reinhart (NYI 2012 1st) was scoreless as his Edmonton Oil Kings defeated the Swift Current Broncos. The win was the 2nd straight for the oil Kings. Kyle Burroughs (NYI 2013 7th) was scoreless as his Regina Pats defeated the Spokane Chiefs 3-2 via the shootout. Burroughs was returning to the Regina lineup after missing 1 game due to a "upper body" body injury. Loic Leduc (NYI 2012 4th) had 14 minutes of penalties thanks in part to an unsportsmanlike misconduct penalty he was called for at the end of the 2nd period. Leduc and his Cape Breton Screaming Eagles were facing the Drummondville Voltigeurs and defeated them in overtime 5-4. Robbie Russo (NYI 2011 4th) was scoreless on 4 shots as his injury depleted 4th ranked Notre Dame Fighting Irish had to settle for a 2-2 overtime tie. The Irish were missing 5 of their top players including Steven Fogarty (NYR 2011 3rd) who was injured Friday evening. Sorry don't have any real info on Fogarty's injury. Jesse Graham (NYI 2012 6th) had the primary assist on his Niagara IceDogs 2nd goal of the game but the IceDogs dropped their 4th straight, this time 8-2 to the Barrie Colts. Graham is 4-10-14 for the season but his team has given up 16 goals in their last 2 games. Adam Tambellini (NYR 2013 3rd) was scoreless on 1 shot and a -2 as his 14th ranked North Dakota dropped a 6-3 decision to Minnesota-Duluth. Tambellini was used as the 4th line center for the 2nd straight game. MacKenzie Skapski (NYR 2013 6th) missed his 6th straight game due to injury and Victor Crus-Rydberg (NYI 2013 5th) missed his 1st game due to injury/sickness (no details were released).